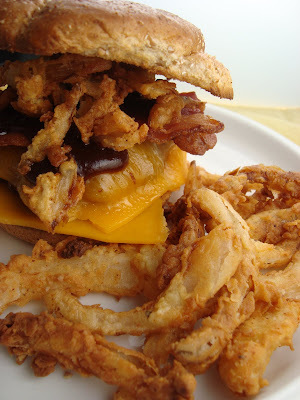 This is Bobby Flay's recipe and it's now my preferred onion ring recipe because it's easy and so flavorful! The touch of cayenne pepper gives it a nice spicy kick and the double coating of flour makes for a great crunch. These are definitely great on their own or used as a topping for burgers, such as the Cheyenne Burger. You can make these as onion rings however I preferred to cut the rings in half to make onion strings. Either way, they're wonderful! Peel the onions and slice them crosswise into 1/4 inch thick slices. 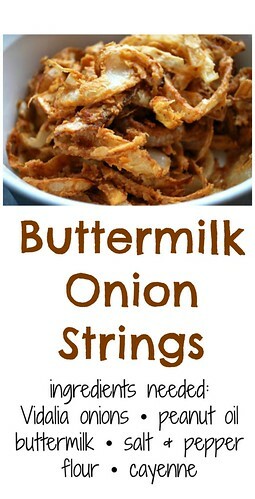 Separate each slice into individual rings and cut each in half to create onion strings. Heat the oil in a heavy bottomed medium stockpot over mediu heat to 375 degrees F. Line a baking sheet with paper towels and set aside. While the oil is heating, put the buttermilk in a large baking dish and season liberally with salt & black pepper. Divide the flour between 2 dishes and season each dish with salt and pepper and 1/4 teaspoon of cayenne. Working in batches, dredge some of the onions strings in one of the dishes of flour and tap off the excess. Dip the strings in the buttermilk, allow the excess to drain off, and then dredge the strings in the second dish of flour, making sure to coat the strings evenly. Tap off the excess and transfer the batch of coated strings to the hot oil. Fry the strings, turning once or twice, until golden brown and tender, about 4 minutes. Remove with a mesh skimer and drain on a baking sheet lined with paper towels. Season immediately with salt. Repeat until all of the onion rings have been cooked. Serve hot. I have a serious weakness for onion rings. These look so good! Unfortunately, I would probably eat the entire batch!